How to make texture appear only in dark spots? 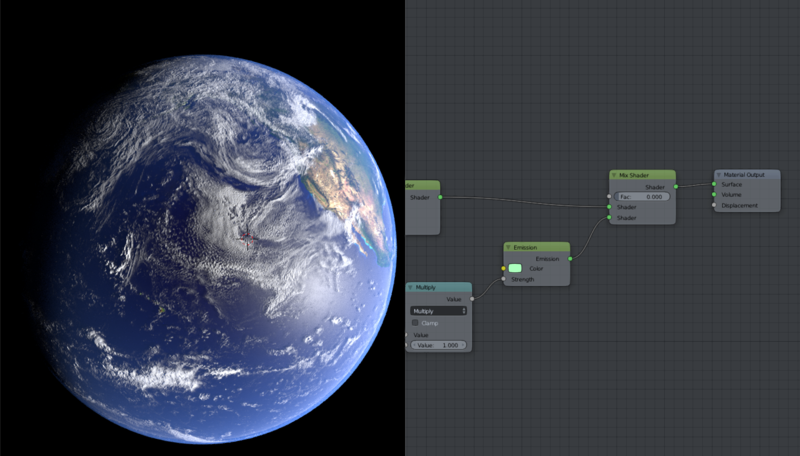 I'm trying to make a realistic earth but now comes the problem of the lights. Since I'd like to make an animation I want the night lights(which are just a texture with an emission shader) to "appear" only where the light does not hit the earth. I really think I just have to plug something into that fac input but I don't know what. When I'll make the earth rotate I want the lights to stay only where the light does not hit the sphere. Please Help me out here, I tried everything. Because the planet is a sphere, with no irregular self-shadowing, you can use a simple mask, in another object's space. In this example, the planet is at the global origin, rotating about Z. Its diameter is 2 units. The sun is down positive X. Add an Empty at the center of the planet. (Its local positive X points toward the sun). It will not rotate, while the planet does, and the mask between emissive and invisible lights will be in the empty's Object Space, not moving. 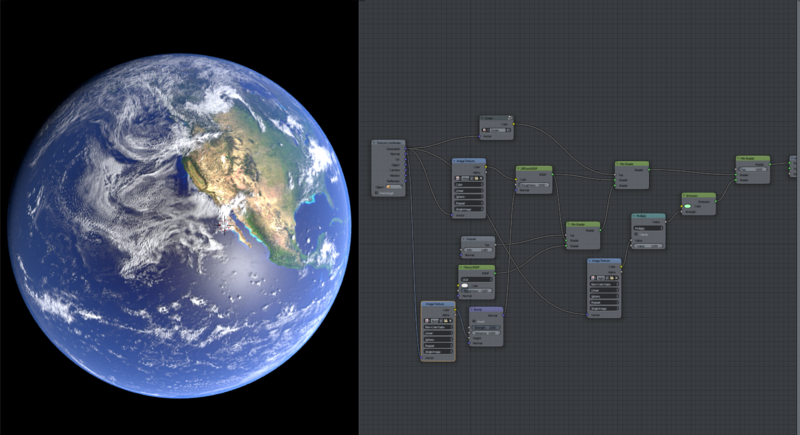 The lights texture is in the planet's Object Space, and turns with the planet. A simple Black/White transition is made by a Color Ramp, down the X of the empty, and centered on it, to make the mask. Dimensions may have to be changed, depending on your model. If you're animating the planet going round the sun, you could parent the Empty to the sun, and the mask will stay pointing in the right direction..
or, in other circumstances, you could constrain the Empty to point its X at the sun in another way. Not the answer you're looking for? Browse other questions tagged nodes light geometry or ask your own question. Make light paths only pass through non-emitted areas? How do I remap colors in Cycles? How do I use render layers to give my model more light/dark contrast? 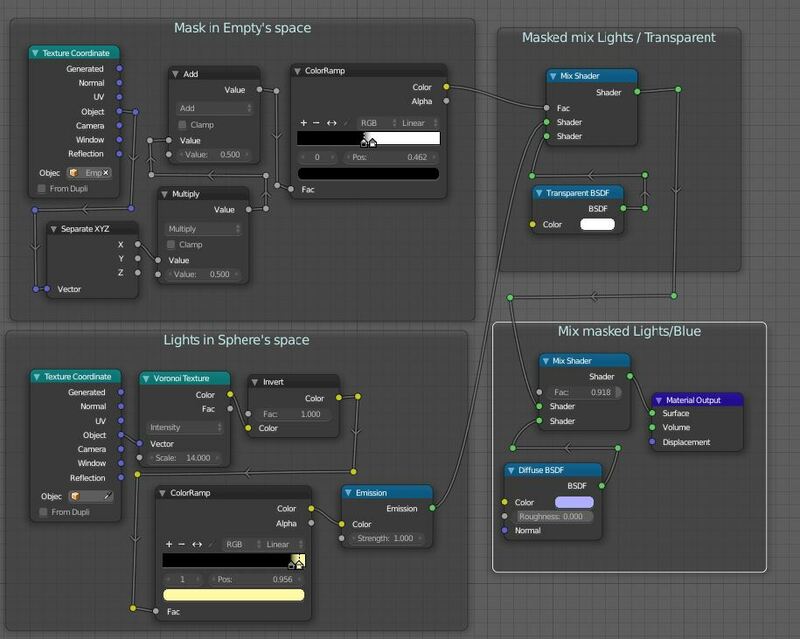 How to make small objects emit a ton of light? How can i make realistic lighting for a 3D car? Is it possible to have an object ignore a certain light source but still be affected by others? How to emit light from texture?